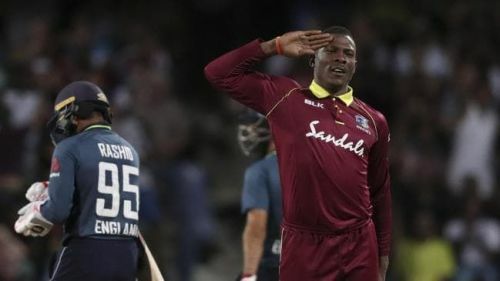 Sheldon Cottrell took a five-wicket haul to hand the WIndies their first victory of this series. West Indies made a sensational comeback in the second ODI to level the series at 1-1. After losing their first encounter against England despite an excellent batting display, the home team emerged victorious by 26 runs in the second. The Windies are now set to host the English Lions for the third ODI at National Cricket Stadium, St George’s, Grenada. The upcoming contest is nicely poised for both the teams as they would be eyeing to take the lead in the 5-match ODI series. The home side have been on a roll since the beginning of this tour. Having won the Test series 2-1, the Windies would be hoping to seal the ODI series as well in the upcoming matches. They bounced back in style to land a counterpunch in the second match. Shimron Hetmyer played an exceptional knock, remaining unbeaten at 104 to make sure his team ended up with 289 runs on the board. Later on, Sheldon Cottrell took a five-wicket haul to get his team across the finishing line. On the other hand, England will be disappointed by their performance in the last match. Having won the toss, they elected to field first hoping to repeat the same feat like the first ODI. However, that was not to be as the visitors ended up on the losing side while chasing a decent total. England bowled well to restrict the hosts under 300, and the stage was set for the batting unit to do their job. But after a flurry of early wickets, the English team was all out for 263 runs. The World No.1 ODI side will be desperate to perform well heading into the third match. Chris Woakes could return to the playing XI to replace Moeen Ali or Tom Curran. Windies are likely to go with an unchanged team after a winning performance. Kemar Roach has been ruled out of the ODI series. Andre Russell will be available for the fourth and fifth ODIs.